There was no immediate pay off in the morning. The clouds were still clinging to the peaks. The sky was bleak, dark and heavy. I would have to hope for a clear day on the return leg of the drive. It was cold too. We all felt the chill in the air. Layers came out, hats, jackets, tracksuit trousers tucked into thick woollen socks. Everyone agreed that if it would guarantee us a beautiful day for our cruise on Milford Sound, we’d settle for less than perfect weather today. It was going to be a stop-start day. We got on the road, stopping almost immediately towards the middle of the Eglinton Valley at what are known as the Mirror Lakes. Presumably on a calm, bright, sunshine filled day the lakes are smooth enough to provide a perfect reflection of the Earl Mountains. It was not that kind of day. We stretched our legs along the promenade, stopping to watch ducks dive in amongst the reeds. While it may not have been functioning as a mirror, the water was as clear as glass. We could see their legs kicking towards the surface as they propelled themselves along. We’d hardly gone much further along the highway when we pulled in again. There was a campsite at Cascade Creek. 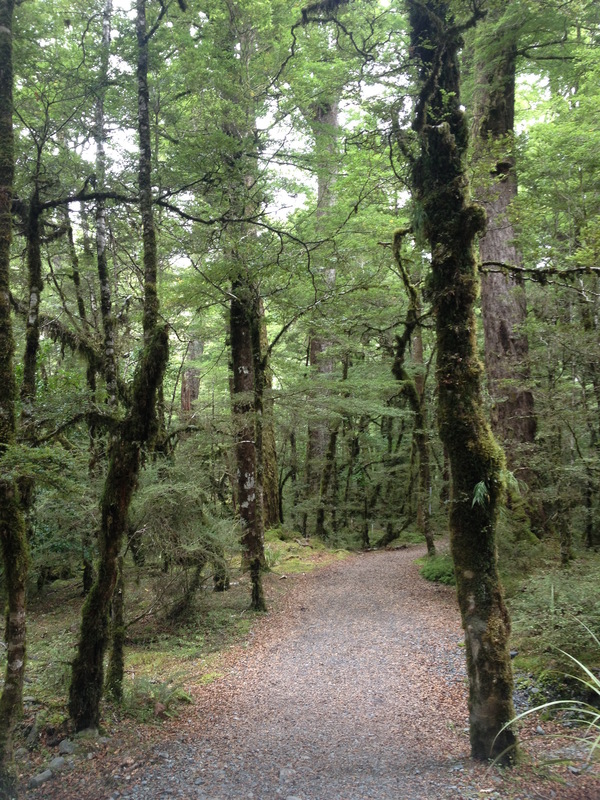 Here we found an easily accessible walk through the giant red beech forests on the shores of Lake Gunn. Having been on the dry side of the Southern Alps for the majority of our trip so far it was surreal to find ourselves in such a lush green landscape. There were massive fallen trunks that I would have expected to be in full decay lining the sides of the path. They were like shipwrecks that formed platforms on the forest floor for new growth. There were mosses and lichens growing on every surface. We found a miniature forest starting its journey to the canopy in the bark of the dead trees. 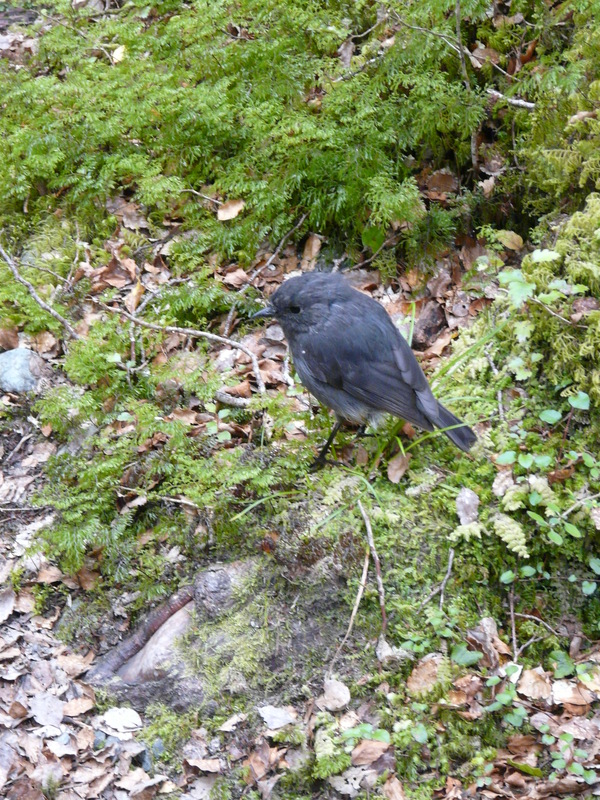 We met an inquisitive New Zealand Robin in the forest. He was no doubt keen to see if we had any food we’d be interested to share with him. After a while, he discovered Lisa’s shoelaces. Mistaking them for a worm, he gave her boots a good few pecks trying to get at what he thought might be a tasty little snack. I tried to encourage him to come along with us, but without a bribe to hand he declined in favour of waiting for a better offer. There were supposedly yellow-fronted parakeets in the forest as well, we might have been able to hear them but they were staying well out of sight. 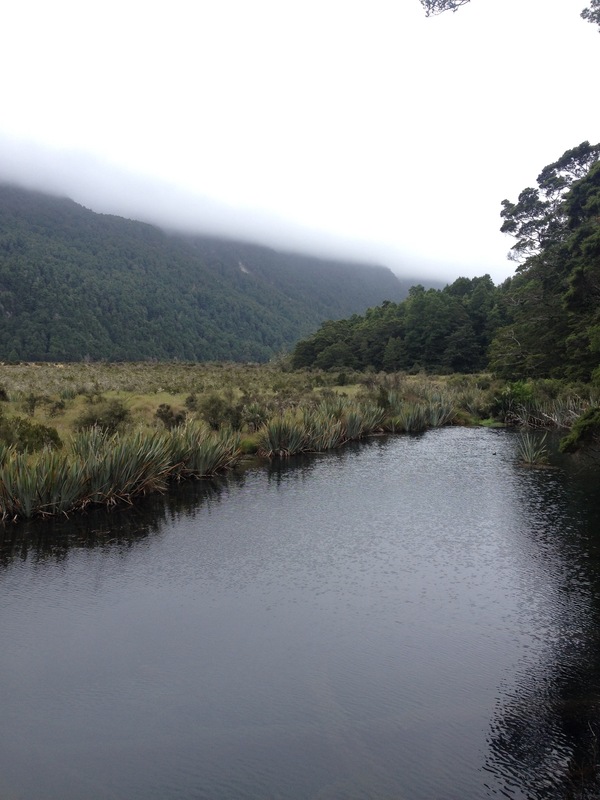 The trail came out on the shores of Lake Gunn. In the distance, nestled between the shoulders of mountains was a hint of blue. A suggestion perhaps, that this day was going to improve. We could see the soft curve of pebbles on the lake bed a few meters from the shore as they disappeared into the depths. We found ourselves again amazed at the clarity of the water. An outlet flowed from the lake was also pristine, it had already began to take on shades of green and blue. It makes you wonder if we’ll ever get used to clear, blue waters of New Zealand. We returned to the van, ready to continue further up the valley. I’ve found myself getting a real kick out of the roads that climb through the valleys to emerge on a dividing range. 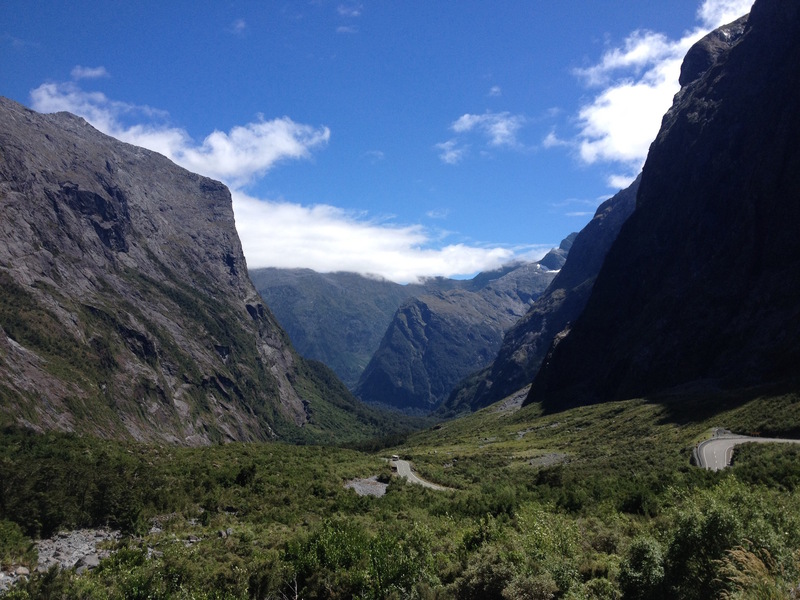 Going deeper into the Fiordland National Park found us another slow incline that twisted and turned along the valley walls until we crested to descend into the next one. More often than not there’s a car park and a viewpoint waiting for us at the top.We were still very much surrounded by giant peaks. 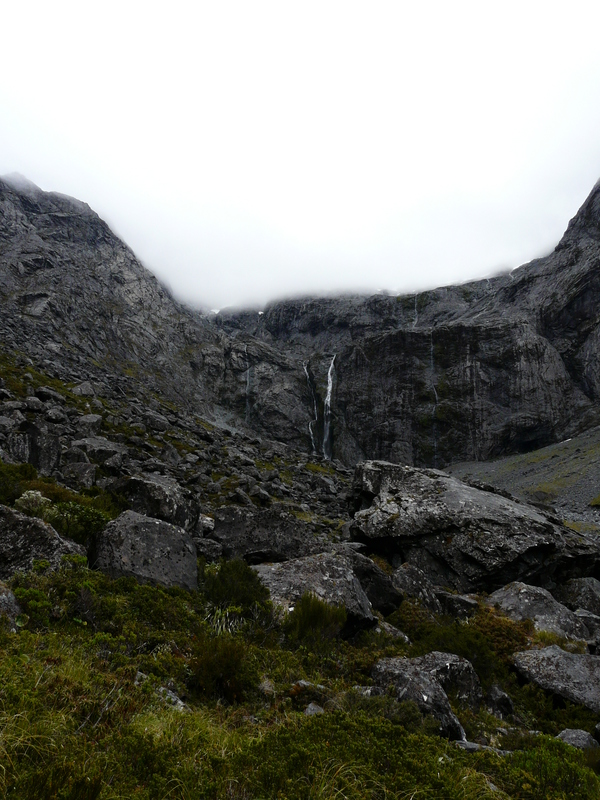 The weather was beginning to turn in our favour the closer we got to Milford Sound. Our silent deal with the weather may yet work out. As we came back down the other side of The Divide, we saw a car park which had a whole pack of tourists taking photos of the trees. We thought it would be best to investigate, perhaps they were on to something good. We pulled over between some giant tour busses and headed over to the now slowly dispersing crowd. Another tick on the list of advantages of doing things for yourself; you’re on your own time. Nobody is telling you when you’ve got to be back on the bus. You don’t have to rush if you don’t want to. There was a squeaking in the trees, not unlike the recordings of dolphins chatting away. Then I saw them. 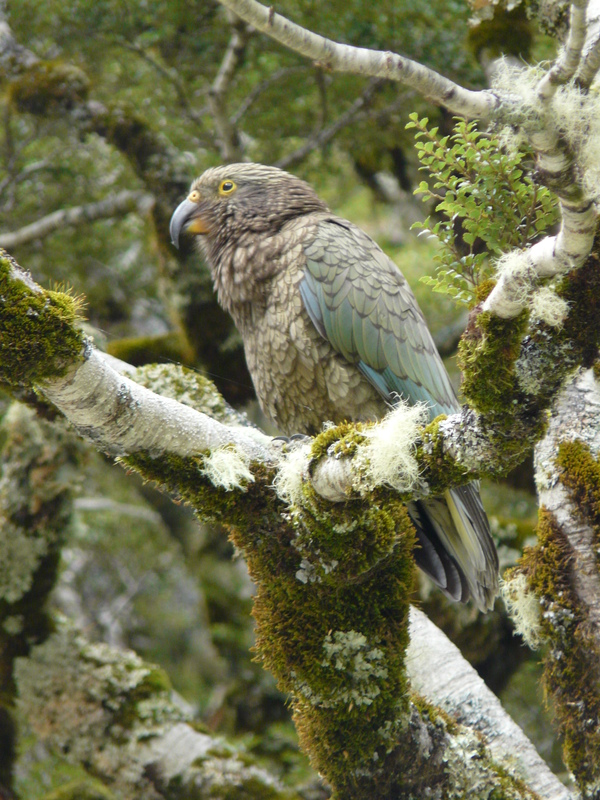 A flock of kea. The world’s only alpine parrots. Apparently they’re not unlike monkeys at wildlife parks. Give them half a chance and they’ll do thousands of pounds worth of damage to your vehicle. They were almost invisible. Their shimmering feathers were grey, blue and green. I convinced myself that they looked ancient, their feathers more like scales. They were a part of the landscape, there was something about them that looked like a moss covered rock. They were much for beautiful than that. As one unfolded it’s wings to investigate and tear apart a road sign, it showed off reds, oranges and yellows as well. 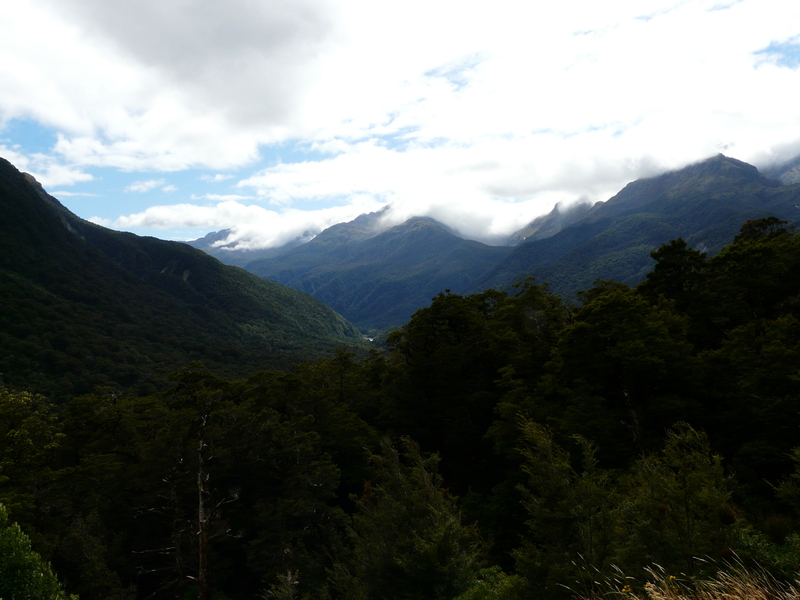 The road climbed, heading towards Homer Tunnel. The mountains closed in. Huge grey vertical walls of granite surrounded us. The clouds formed a low false ceiling. Water trickled over the edge of the cliffs into the valley. We might have reached the end of the world. There was nothing to do but turn back. Of course that’s not what happened. However, were it not for Homer Tunnel this would be the end of the road. Lights glisten off the moisture inside. Is that a pressure-headache forming? It’s less than a mile long, cutting straight through the mountains. That’s a lot of weight sitting on top of us. Then, you’re through. Emerging into bright blue skies and sunshine. People on this side of the tunnel were in shorts and t-shirts. It could have been ten degrees warmer. It felt like a different world. We took another walk through a very different forest. You can smell the humidity. It’s a rainforest. A pounding river cuts a chasm through the rocks. We follow it’s course until the end of the road. Mountains rise straight up out of the water into an almost cloudless sky. It’s a lot less Middle-Earth, a lot more the Lost World. I’d be less surprised to see a pterodactyl than I would a hobbit. I was expecting there to be a small town here. With the number of tourists I just assumed there would be a requirement for a post office, a general store. There’s nothing. Nobody lives here. There’s no phone signal. No internet. No rubbish disposal. A ferry terminal across the tidal plain, a restaurant with a gift shop and a small lodge. That’s it. It’s a wilderness area for sure. 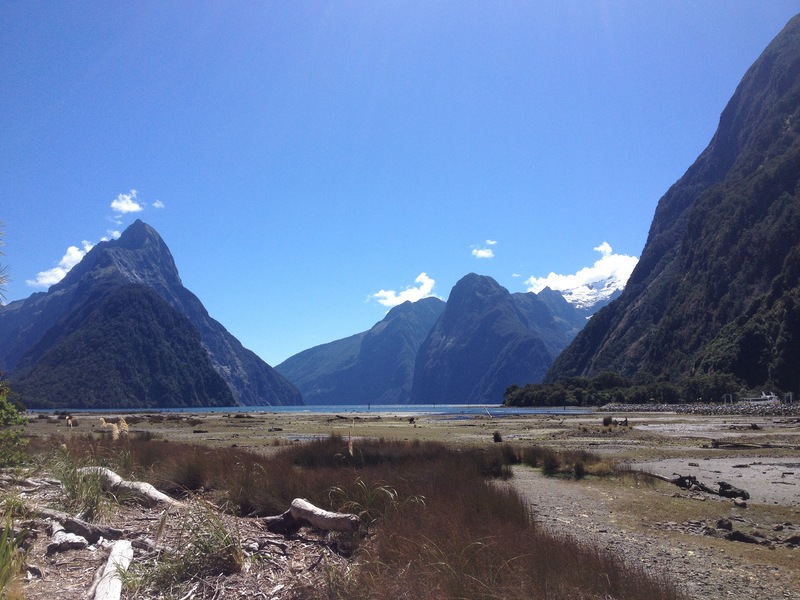 We had arrived at Milford Sound. The word should have been style! Thanks very much! My photography definitely needs as much work as my writing. Well done! This definitely transported me! Thanks for taking us along with you. 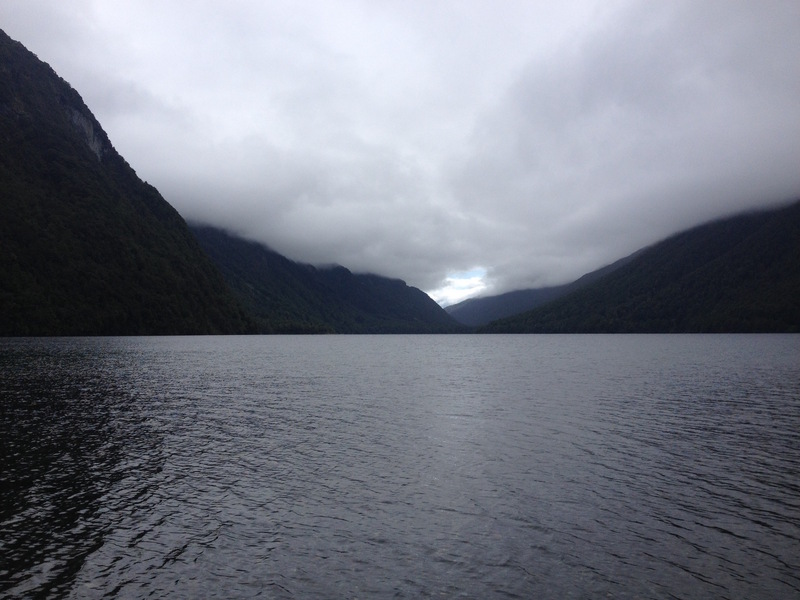 We made the same trip to Milford Sound, but alas, the weather did not cooperate for us and our cruise was cancelled. That weather is pretty fickle down there. Well written, beautiful imagery! Keep it up! Thanks! I’m really trying to work on the descriptions, so it’s good to know it worked for you. We were unbelievably lucky with the weather. Almost everything turned out just right on the day!